New York : Atheneum, 1985, c1971. 203 p. : ill. ; 23 cm. 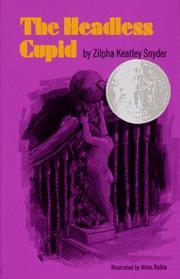 The headless Cupid / Zilpha Keatley Snyder ; ill. by Alton Raible. 100 ME:PersonalName 1 $a Personal name Snyder, Zilpha Keatley. $c Statement of responsibility Zilpha Keatley Snyder ; ill. by Alton Raible. $c Date of publication, dist, etc 1985, c1971. 520 Summary $a Summary, etc. note Life is never quite the same again for eleven-year-old David after the arrival of his new stepsister, a student of the occult.